Allan Leighton was personally appointed by the prime minister early last year to turn around the loss-making Royal Mail. The 50-year-old, who faced down the threat of the first national postal strike in seven years, is widely respected as one of Britain's best business managers. He is certainly one of the most "plural" and has shown no unwillingness to take on some of the toughest jobs around. 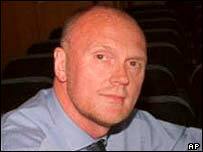 He is on the board of nine other companies, acting as chairman of Lastminute.com and deputy chairman of struggling football club Leeds United. The crisis at Leeds is such that he has offered to lend the club millions of pounds of his own money and is thought likely to have a key role in any rescue takeover. Mr Leighton is also a director at BSkyB and was recently handed the unenviable task of persuading shareholders to accept the appointment of 30-year-old James Murdoch as chief executive of the company his father Rupert chairs. A married father-of-three, Allan Leighton even runs a website, Going Plural, which offers help to budding entrepreneurs. He began his career with a lengthy stint at Mars, but he made his name at supermarket group Asda, transforming it from a £500m company to one sold to US giant Wal-Mart for £6.2bn in 1999. But what is likely to come of his time at the Royal Mail? Mr Leighton has already had some success in turning the company around. In May, the company posted its first improvement in trading performance for five years. By then, it said, it was losing "just" £750,000 a day, down from an average of £1.2m a day the previous year. Mr Leighton told the BBC he thought the company could be "profitable" by the end of the year. Some quite painful changes have been made to get to that point, however. Nearly 17,000 jobs have already gone and more than 30,000 are expected to have been lost by 2005. Mr Leighton tried to win round his staff by appealing to them directly - and succeded, at least on a national level. At Asda, his success has been partly put down to his introduction of "huddles" - meetings where staff would get together to discuss daily issues. At the Royal Mail, he also tries to have a direct relationship with the workforce. He says he gets hundreds of e-mails a week from staff, and that most of his best ideas have come by talking directly to staff about their ideas and problems. Indeed, he recently sent a letter to all staff asking them not to walk out. "If you vote with the activists amongst the union against the deal - or don't vote at all - we begin the process of commercial suicide," he warned. The CWU, however, is not the only body to face confrontation with Mr Leighton. He has also had several bruising encounters with the regulator Postcomm, which is trying to open up the postal market. So worried is he by the effects of the regulator's plans, he has warned, that he could end up taking it to the High Court or European Court to ensure the Royal Mail's survival. Are you affected by the strikes?